1. MBS yields have collapsed recently due to the latest action by the Fed. That of course made these REIT companies good money on a mark-to-market basis. But the MBS securities they hold have declined in duration as lower mortgage rates accelerated prepayments. Now mREITS will be forced to buy new much lower yielding MBS bonds. 2. mREITs' financing costs are linked to term MBS repo rates (secured financing in which the REIT borrows from a bank for a period of time - maybe 2-3 months - posting their MBS holdings as collateral). 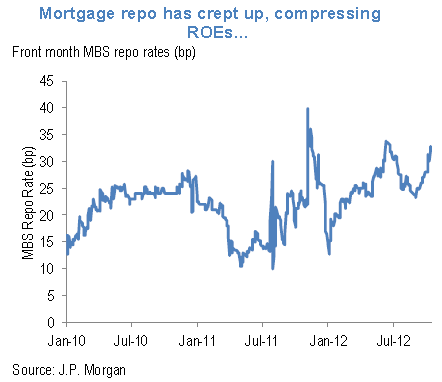 The repo rate has been elevated recently. With lower interest income and higher interest expense, the equity of these portfolios is expected to generate lower returns (ROE) going forward, making these investments less attractive.